Smoke Rise Country Club pool is a sanctuary. 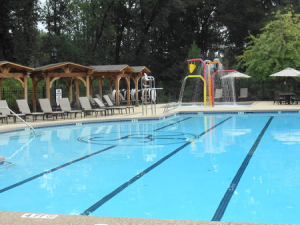 This salt water pool has a little something for everyone including a baby pool with multi-fountain, hot tubs, cold waterfall spa, junior Olympic size for swimming laps and a slide for the kids. The seating area is second to none as many of them are tucked away from the pool in covered areas great for dining and staying cool while your family plays in the pool.